oh I love it! hope you all had a great day, despite the early hour start :) this is the 4th or 5th day in a row that J has gone to bed approaching 9pm --- that ends today!! she was wiped after today! i'm wiped after eating a ton of random cheeses and meat -- ugh. i'm eating soups and salads for a month, i just can't eat very much rich food anymore! did your rice pudding turn out nice? I didn't have a chance to make it last night, so Big Sis and I had it this morning. It was yummy. It was her second breakfast, of course, after her 5 AM mac and cheese thing. UGH. Mine still fell asleep super-late. I should be asleep, too! My mother and company come into town tomorrow! I'm so tired I'm wired. Hate that feeling! I made Christmas lasagna and salad for dinner. Despite many false starts (and many trips to Walgreen's for Mr. B, as it was the only place open and we kept running out of everything), dinner finally happened, everyone opened presents, and everyone seemed happy. Whew! I'm punchy. Time for bed. Good night, and merry, merry, merry Christmas! Can't wait to hear how yours turned out! I love your collage! Looks like a great Christmas Day! It was fun seeing the before, during and after pics on your instagram! Aw it's all so special and fun. I love it. What a magical christmas you had!! And snow too!?! you lucky ducks! 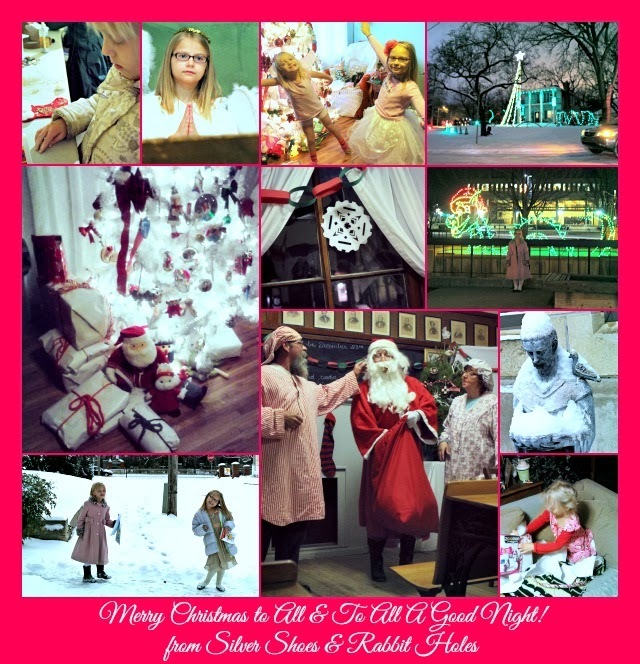 :D everything is so festive and pretty--- your girls will treasure these times! We did have a white Christmas this year! The snow from a few days before held on until Saturday. Yesterday, the temps plummeted again. The 25th was not my best day, but it's yet another reason not to rush the season. Christmas isn't over yet! :) Merry Christmas!